Best Museums, Top 50 Postmodernist Exhibition Venues. Turbine Hall, in The Tate Modern. 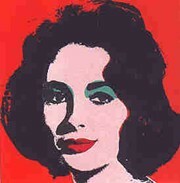 Liz Taylor (1962) Silkscreen Portrait. "Contemporary art" is an umbrella term which is commonly used to describe all artworks created in the recent past. It embraces traditional media, like drawing, painting, sculpture, printmaking and architecture, as well as new media such as photography, animation, video, installations, performance, conceptual art and design. An alternative term is "postmodernist art". Unlike traditional art museums, which typically occupy classically designed buildings, with interiors planned around their permanent collections, contemporary art galleries tend to occupy purpose-built display spaces. Furthermore, they often have no collection of their own, and thus have complete freedom to focus on temporary exhibits, including site-specific installation art and various types of performance art. That said, a number of postmodernist galleries - including the Tate Modern, the Pompidou Centre, the Guggenheim New York and MoMA - also own substantial collections of late-20th century art and still manage to host outstanding temporary exhibits. The following list of galleries features 50 of the best art museums in the world. Europe and America still predominate, although we can expect significant growth in both Asian and Latin American venues. Opened in 2007 by Belgian art collector Baron Guy Ullens, and currently visited by more than 1 million people annually, the centre contains three large art galleries plus the first contemporary arts library in China. Recent exhibitions of Chinese art have included works by Qiu Zhijie, Olafur Eliasson, Ma Yansong, Tatsuo Miyajima, Liu Xiaodong, Wang Jianwei, Gu Dexin, Zhan Wang and Yung Ho Chang. Launched in 2007, this Hong Kong museum was rated one of the best contemporary art museums in the world. It is noted for its annual Contemporary Artist of the Year Award (MACAYA) and for its Quarterly publication Oeuvre Journal of Art (OJA). Founded in 2005 by the Samuel Kung Foundation, this museum was the first independent, contemporary art institution in the city of Shanghai. Its main aim is the promotion of Chinese and international contemporary art through a variety of exhibitions featuring both established and emerging contemporary Chinese painters, as well as retrospectives for leading figures in the visual arts world. In addition to showcasing modern Chinese styles - like Cynical Realism - the museum is also noted for its collaborations. In 2007, for instance, it co-organized the exhibition "Art in America" with the Guggenheim Museum in New York; recently, it partnered with the Korea Foundation to present an exhibit of East Asia Contemporary Art, which included works from Japan, Korea, China, and Taiwan. Founded in 1995 and located in Kiba Park, this is the leading postmodernist art museum in Tokyo, Japan. Its collection and temporary exhibits have featured contemporary works by the top contemporary artists from Japan and overseas, including Andy Warhol, Roy Lichtenstein and Francis Bacon. Opened in 1990, this museum highlights the work of the best camera artists in Japan. Its permanent collection contains photographs by more than 300 photographers including: Ken Domon, Shihachi Fujimoto, Takeji Iwamiya, Motoichi Kumagai, Michiko Matsumoto, Aizo Morikawa, Tadayuki Naitoh, Yoshino Oishi, Koji Sato, Tokihiro Sato, Mieko Shiomi, Teiko Shiotani, Yutaka Takanashi, and Toyoko Tokiwa. See also: Greatest Photographers (Top 200). A hypermodern gallery of contemporary art, it is situated in the Melbourne Arts Precinct, in the suburb of Southbank, the building was erected in 2002, by Wood/Marsh Pty Ltd Architecture. It has no permanent collection; instead, it concentrates on commissioning works for exhibitions in its four gallery spaces. Dedicated to contemporary artworks by Australian and international artists, it was launched in 1991. In 2010 it received a 2-year $58 million renovation and extension. It is located in the Art Deco style former Maritime Services Board Building in Sydney, Australia. The museum was the brainchild of Australian artist John Power (18811943), who donated his wealth to the University of Sydney with the aim of educating the Australian public in modern art of the 20th century. Opened in 1985 by the art collector Charles Saatchi (b.1943), it has occupied three different sites, first in North London, then at the South Bank, and finally Kings Road Chelsea. Like its address, the Saatchi collection has also changed considerably. To begin with, it featured American minimalism, then Young British Artists like Tracey Emin (b.1963), then postmodernist art from America. Both the gallery's acquisition and exhibition policies are in line with Saatchi's stated goal of exhibiting contemporary works of art that would not be seen in established London institutions like the Tate Modern. In 2010, Saatchi announced that the gallery would be given to the British public, and would become known as the Museum of Contemporary Art for London. Owned by Jay Jopling, the gallery has three London venues - in Hoxton Square , Mason's Yard, and Bermondsey. The gallery made its reputation by being the first to give solo shows to several of the Young British Artists (YBAs), such as Tracey Emin, and for exhibiting Damien Hirst. Other artists showcased at the gallery include: Jake and Dinos Chapman, Gilbert and George, Antony Gormley, Anselm Kiefer, Marc Quinn, Sam Taylor-Wood, Gavin Turk and the camera artists Jeff Wall and Andreas Gursky. Designed by Renzo Piano and Richard Rogers, the Pompidou Centre contains the French National Museum of Modern Art, which is the biggest museum of modern and contemporary art in Europe. The centre attracts about 6 million visitors per year, and its building is one of the most iconic architectural achievements of the 20th century. Showcases a wide range of modern and postmodernist art, including works by all-time greats such as Yves Klein and Joseph Beuys. See also: Yves Klein's Postmodernist art (1956-62). Inaugurated in 1937, this complex is devoted to modern and contemporary art. The eastern wing houses the Museum of Modern Art of the City of Paris, while the western wing houses the Palais de Tokyo. It is named after the adjacent street, formerly known as the Avenue de Tokio. The Palace of Tokyo organizes a wide variety of avant-garde art, embracing contemporary forms including photography, installation, video, electronic, performance and conceptual art. inaugurated in 2010, this museum - a branch of the Pompidou Centre in Paris, and the largest temporary exhibition space outside Paris - puts on temporary exhibitions from the large collection of 20th and 21st century artworks in the French National Museum of Modern Art. Its program of 3-4 temporary shows per year attracts some 550,000 visitors annually. The museum also partners with the Mudam Museum of Modern Art in Luxembourg. Known up until 2010 as the Villeneuve d'Ascq Museum of Modern Art, LaM is the only arts museum in Europe to focus simultaneously on 20th and 21st centuries works of Art Brut as well as modern and contemporary art. Its collection - featuring painting, sculpture, works on paper, including photography, prints, illustrated books and electronic media - includes masterpieces by Pablo Picasso, Georges Braque, Fernand Leger and Alexander Calder, plus the biggest outsider art collection in France. LaM also has a library (with almost 40,000 books) and an outdoor sculpture park. Set up in the 1990s by a group of Berlin-based artists and students, this contemporary art institution does not possess a collection of its own. Instead, it concentrates on holding exhibitions of the latest art by new and emerging artists. They include Richard Serra, Wolfgang Breuer, Maya Kishi-Anderson, Annette Kelm, Ceal Floyer, and Barbara Rosenthal. KW collaborates with other avant-garde venues, including MoMA PS1 in New York, Documenta and the Venice Biennale. In each even-numbered year since 1998, KW has organized the Berlin Biennale to establish Berlin as one of the major contemporary art centres of Europe. This Florentine-style villa was acquired by the city of Munich in 1924, and today contains one of the city's most famous collections of modern art (Stadtische Galerie im Lenbachhaus). It features works representing several modern art movements, by 20th century painters including Carl Spitzweg, Wilhelm Leibl, Lovis Corinth, Max Slevogt and Fritz von Uhde, Wilhelm Trubner, Hans Thoma, Carl Theodor von Piloty, Franz von Stuck, Franz von Lenbach, Franz Marc, August Macke, Gabriele Munter, Christian Schad, Rudolf Schlichter, and others. In addition, the museum has a first class holding of late-20th century art, including contemporary works by Christian Boltanski, Joseph Beuys, James Coleman, Olafur Eliasson, Dan Flavin, Andreas Hofer, Jenny Holzer, Stefan Huber, Asger Jorn, Ellsworth Kelly, Anselm Kiefer, Roman Opalka, Sigmar Polke, Arnulf Rainer, Gerhard Richter, Richard Serra, Andy Warhol, as well as artists of the Viennese Actionism tendency. Inaugurated in September 2002, this national museum of contemporary art is located close to the Alte Pinakothek and Neue Pinakothek, as well as the Antikensammlungen, Museum Brandhorst, the Glyptothek, the Lenbachhaus and the new combined Agyptisches Museum and the Hochschule fur Fernsehen und Film, in Munich's art district. Consisting of four departments: Art, Architecture, Design and Works on Paper, the Pinakothek holds the National Collection of Modern and Contemporary Arts, the National Collection of Works on Paper, the National Museum for Design and Applied Arts, and is considered to be one of the most important centres of modern art in Europe. A wide range of modern art movements are represented in the collection, including Fauvism, Expressionism, Cubism, Constructivism, Metaphysical Painting, Bauhaus, Surrealism, and Abstract Expressionism. A number of Contemporary art movements are represented, including Pop Art, Minimalism, and Neo-Expressionism. Postmodernist artists represented include: Lucio Fontana, Alberto Burri, Richard Serra, Carl Andre, Donald Judd, Joseph Beuys, Marino Marini, Georg Baselitz, Gerhard Richter, Sigmar Polke, Nam June Paik, Wolf Vostell, Bill Viola, Jeff Wall, Bruce Nauman, Marlene Dumas, Jorg Immendorff, Martin Kippenberger, Sam Taylor-Wood, to name but a few. Opened in 1992, this contemporary arts museum has no permanent collection: instead, it focuses on holding temporary exhibitions of the latest artworks, by local, national and international artists. In 2002, the Italian cultural magazine ARTE described the Kunsthalle Vienna as one of the six best contemporary art centres in Europe. Founded in October 2000, this the only national institution mandated to collect and exhibit contemporary Greek and international art in Athens. Close to the centre of Athens as well as the Acropolis and the New Acropolis Museum, EMST is currently undergoing a program of renovation and expansion. Its permanent art collection focuses on modernist and postmodernist works from the mid-20th century onwards. It includes art by Ilya Kabakov, Nan Goldin, Gillian Wearing, Vlassis Caniaris, Dimitris Alithinos, Joel Sanders, Andreas Angelidakis. In addition, it features a major collection of video art, including works by Bruce Nauman, Nam June Paik, Bill Viola, Vito Acconci, and others. Founded in 1874, the Stedelijk is dedicated to modern and contemporary art, as well as design of the 20th century. It is situated close to the Van Gogh Museum and the national Rijksmuseum. Its 90,000-item collection features works by Vincent van Gogh, Ernst Ludwig Kirchner, Henri Matisse, Jackson Pollock, Karel Appel, Andy Warhol, Willem de Kooning, Marlene Dumas, Lucio Fontana, and Gilbert & George. Its design collection includes representative works from the De Stijl group, the German-based Bauhaus School of Design, as well as movements like Russian Constructivism. The museum also has a rich collection of lens-based art: with works by important photographers such as Brassai (Gyula Halasz), Laszlo Moholy-Nagy, Erwin Blumenfeld, Man Ray, Ed van der Elsken, Eva Besnyo, and Cas Oorthuys; and video art by Gilbert and George, Bill Viola, Nam June Paik and Bruce Nauman. Opened in 2002, the museum's permanent collection features a selection of the most important Italian artworks since the 1960s. It includes representative works from: group Forma 1, by Carla Accardi, Leoncillo and Ettore Colla, Piero Dorazio, Achille Perilli, and Antonio Sanfilippo; Arte Povera, by Mario Ceroli and Pino Pascali; the Scuola di Piazza del Popolo, by Tano Festa, Titina Maselli, Mimmo Rotella, and Mario Schifano. Opened in 2010, this national centre of contemporary works - winner of the Royal Institute of British Architect's 2010 Stirling Prize for architecture - operates as a multidisciplinary space, consisting of two museums: "MAXXI art" and "MAXXI architecture". The two permanent collections feature works by Ed Ruscha, Gilbert & George, Anish Kapoor, Gerhard Richter, Alighiero Boetti, William Kentridge, Gino De Dominicis, Michael Raedecker, Francesco Clemente, as well as design archives of architects Aldo Rossi, Carlo Scarpa, and Pier Luigi Nervi. Opened in 1958, Sweden's Museum of Modern Art, standing on the island of Skeppsholmen in Stockholm, specializes in Swedish and international modern and contemporary art. Highlights of its collection include works by Picasso and Dali, as well as a model of the Monument to the Third International (1920) by Vladimir Tatlin (1885-1953). The collection also features works by Louise Bourgeois, Niki de Saint Phalle, and Robert Rauschenberg, as well as contemporary artists. Opened in 1995, the Museu d'Art Contemporani de Barcelona (MACBA) - designed by Richard Meier & Partners - focuses on post-1945 Catalan and Spanish art, during three periods: 1940s and 50s; 1960s and 70s; and 1980 onwards. Next door to the museum is the Barcelona Centre of Contemporary Culture (Centre de Cultura Contemporania de Barcelona, CCCB). Established in 1997 and designed by the famous deconstructivist architect Frank O Gehry, this Basque museum of contemporary art stands alongside the Nervion River in Bilbao. It is one of several museums around the world, owned and operated by the Solomon R. Guggenheim Foundation. The museum holds permanent and visiting exhibits of works by Spanish and international artists. It receives over 1 million visitors annually. Inaugurated in 1992, this is Spain's national museum of 20th century art. It is located close to the Prado Museum and the Thyssen-Bornemisza Museum. Highlights of the museum's permanent collection include works by Pablo Picasso - notably his masterpiece Guernica (1937) - and Salvador Dali, as well as Antoni Tapies, Julio Gonzalez, Eduardo Chillida, Pablo Gargallo, Lucio Munoz, Luis Gordillo, Jorge Oteiza and Jose Gutierrez Solana. It also features photography, including war photographs by camera artists like Robert Capa (1913-54). Although the focus remains Spanish art, the museum also owns works by international painters and sculptors including: Yves Klein, Lucio Fontana, Richard Serra, Bruce Nauman, Donald Judd, Damien Hirst, Julian Schnabel, Joseph Beuys, Wolf Vostell, Nam June Paik, Gabriel Orozco, Clyfford Still, and Francis Bacon. The museum's art library contains over 100,000 books, and some 1,000 videos. One of the oldest and best art museums in Europe, the Kunstmuseum contains the largest and most important public art collection in Switzerland. In addition to its collections of Old Masters, its Impressionist, Post-Impressionist, Expressionist and Cubist paintings, as well as works of Constructivism, Dadaism and Surrealism, the museum maintains an impressive holding of contemporary and postmodernist art, by Swiss, German, Italian, and American artists, such as Joseph Beuys, Georg Baselitz, A.R. Penck, Walter Dahn, Martin Disler, Siegfried Anzinger, Rosemarie Trockel, Robert Gober, Andy Warhol, Jasper Johns, Brice Marden, Bruce Nauman, Jonathan Borofsky, Francesco Clemente, Mimmo Paladino, Enzo Cucchi, and others. Established in 1964, the Museum of Contemporary Art in Montreal - Canada's only cultural venue devoted to both performing and visual arts - maintains a collection of over 7,000 works of art by more than 1,500 contemporary artists, focusing on postmodernist Canadian art, as well as important international artists. Its collection embraces photographs, installation, video art and works on paper, as well as paintings and sculptures. Founded in 1985, the CMCP contained Canada's best art and documentary photography, including works by the great Armenian-Canadian portraitist Yousuf Karsh (1908-2002). Sadly, however, its collections and exhibitions have since been absorbed by the National Gallery of Canada. Founded in 1999, MOCCA's brief is to exhibit, collect, and promote contemporary art by Canadian and international artists, whose artworks address the key issues of our times. Since 2005, more than eight hundred contemporary artists have been showcased in 80 exhibitions. The Museum of Contemporary Canadian Art also has a permanent collection of some 400 items by more than 150 Canadian artists. Note: all galleries and museums listed in State order. The original venue in a group of eleven modern and contemporary art galleries, owned by Larry Gagosian, it was followed by three venues in New York; two in London; one in each of Rome, Paris, Geneva, Hong Kong, Athens and Beverly Hills. The gallery has showcased all the great postmodernist artists, including: Francis Bacon, Yves Klein, Andy Warhol, Cy Twombly, Jeff Koons, Damien Hirst, the sculptors Mark di Suvero, Richard Serra, the contemporary art photographers Nan Goldin and Richard Prince, as well as the Deconstructivist architect Frank O Gehry, to name but a few. Larry Gagosian is a constant presence in ArtReview's "Top 10" important people in the contemporary art world. Opened in 1983, the museum's collection primarily consists of American and European art created since 1940. Valuable acquisitions have included: part of the Giuseppe Panza private collection (works by Jean Fautrier, Roy Lichtenstein, Mark Rothko, Franz Kline and Antoni Tapies); the Barry Lowen private collection of minimalist and post-minimalist art (works by Dan Flavin, Elizabeth Murray, Julian Schnabel, Joel Shapiro, Ellsworth Kelly, Agnes Martin, Frank Stella, and Cy Twombly); donations from the Rita and Taft Schreiber collection (drawings and oil paintings by Jackson Pollock, Piet Mondrian, and Arshile Gorky); donations from Phil and Beatrice Gersh (includes Pollock's action painting Number 3, 1948 and the stainless steel sculpture Cubi III (1961) by David Smith - plus works by Ed Ruscha, Cindy Sherman, and Susan Rothenberg); a bequest from Marcia Simon Weisman (features works by Richard Diebenkorn, Sam Francis, Willem de Kooning, and Barnett Newman. Other highlights include the 1998 exhibition of word art by Christopher Wool (b.1955). Now established as one of the best art museums in America, MOCA Los Angeles is also noted for its temporary thematic-survey exhibitions of postwar art. Please see also: Los Angeles County Museum of Art (LACMA). Founded in 1941 (as the La Jolla Art Museum), MCASD is an art museum devoted to art created since 1950. In addition to paintings and sculptures by Pop artists, minimalists and neo-expressionists, MCASD has also hosted exhibitions of camera art by photojournalists such as Larry Burrows (1926-1971), Don McCullin (b.1935), James Nachtwey (b.1948) and Steve McCurry (b.1950), as well as documentary works by camera artists like Nadav Kander (b.1961). It has a permanent endowment fund of over $40 million, and a total annual budget of $6 million. Set up in 1935, SFMOMA holds an internationally acclaimed collection of 20th century art, with over 26,000 items of sculpture, painting, art photography, architecture, design, and media arts. Artists represented include urban genre painter Edward Hopper, minimalist Ellsworth Kelly, post-minimalist Eva Hesse, surrealist Rene Magritte, and Neo-Plasticism inventor Piet Mondrian, and Dadaist Marcel Duchamp, as well as Pop art pioneers Jasper Johns and Andy Warhol, Colour Field painter Mark Rothko, Neo-Expressionist Francis Bacon and Photorealist Chuck Close. Camera artists represented include: Edward Weston (1886-1958), Paul Strand (1890-1976), Irving Penn (1917-2009), Richard Avedon (1923-2004) and others. Postmodernist camera artists exhibited include the Canadian Jeff Wall (b.1946), the German Andreas Gursky (b.1955) and the American Cindy Sherman (b.1954), all of whom can command seven-figure prices for their photographs. The drip-painter Jackson Pollock had his first museum exhibition at SFMOMA, as too did abstract expressionists Arshile Gorky and Clyfford Still. SFMOMA is also noted for its seminal exhibition of feminist art, entitled "WACK! Art and the Feminist Revolution" curated by Connie Butler (2007). It included works by Judy Chicago (b.1939) and Barbara Kruger (b.1945). SFMOMA was the leading museum of 20th century art in America until the Museum of Contemporary Art opened in Los Angeles in 1987. Started in 1973, the collections of UCR/CMP form the largest single collection of photographs in the Western half of the United States, and are prized by photography researchers, film producers, magazine publishers, students of camera technology and photo clubs.. Every aspect of camera art is covered, including the history of photography, 19th century pictorialism, sharp focus modernism, street photography, portraiture, and so on. In addition, it features the Bingham Technology Collection of 10,000 cameras, viewing devices, and photographic apparatus. The Bingham Collection is divided into four parts: The Kibbey Zeiss-Ikon Collection; Wodinsky Ihagee-Exacta Collection; Curtis Polaroid Collection and the Teague Kodak Brownie Collection. An important part of the Print Collection is the Keystone-Mast Collection, which contains over 250,000 original negatives and 100,000 paper prints. See also: Is Photography Art? Established in 1964, by Larry Aldrich (19062001) who sold his art collection to fund the institution and its inaugural collection, the museum was renamed The Aldrich Museum of Contemporary Art in 1967, and its collection was sold in 1981, so as to concentrate on its principal aim of exhibiting only the latest art. Artists showcased include Robert Rauschenberg, Jasper Johns, Frank Stella, Cy Twombly, Anslem Kiefer, and many others, including a number of lens-based artists. Founded in 1924, MOCA Jacksonville, ranked among the largest contemporary art institutions in the Southeastern United States, is part of the University of North Florida. Its permanent collection covers painting, sculpture, video and new media, with works by Hans Hofmann, Joan Mitchell, James Rosenquist, Ed Paschke, and other contemporary artists. Opened in 1967, this is one of the world's largest contemporary art centres. Famous artists whose debut exhibitions took place here, include the self-portraitist Frida Kahlo (19071954) (wife of Diego Rivera), the Neo-Pop sculptor and painter Jeff Koons (b.1955). Other showcased artists include the local feminist Judy Chicago (b.1939). The museum's collection includes representative paintings, prints, and sculpture, from movements like surrealism, pop art, minimalism, and conceptual art; as well as contemporary photography, video, installation, and related media. The museum also covers contemporary dance, theatre and multidisciplinary arts. For other Chicago venues, see: Art Institute of Chicago. Established in 1984 by Columbia College Chicago, it is famous for its promotion of emerging camera artists. The MoCP's permanent collection includes more than 7,000 photographs by such photographers as Ansel Adams (1902-84), Harry Callahan, Henri Cartier-Bresson (1908-2004), Irving Penn (1917-2009), Dorothea Lange (1895-1965), Julia Margaret Cameron (1815-79), Walker Evans (1903-75), Aaron Siskind, and Victor Skrebneski. Established in 1936 as the Boston Museum of Modern Art, devoted to the exhibition of contemporary artists, it has held a number of cutting edge exhibitions, featuring German Expressionism, Pablo Picasso (including his work "Guernica"), Le Corbusier, Jim Dine, Jasper Johns, Claes Oldenburg, Morris Louis, Kenneth Noland, Frank Stella, Andy Warhol (including his Campbell's Soup Cans and portraits of Marilyn Monroe, Elvis Presley, and Elizabeth Taylor), Donald Judd, Cornelia Parker, Robert Morris, Tara Donovan, Louise Nevelson, Francesco Clemente, Anselm Kiefer, Robert Mapplethorpe, Sophie Calle, Olafur Eliasson, Anish Kapoor, Shepard Fairey and Mark Bradford. See also: Museum of Fine Arts Boston. Founded in 1999, MASS MoCA is one of the largest institutions of contemporary visual art and performing arts in America. It has 19 galleries and performing arts spaces, and is also the home of the Bang on a Can Summer Institute, and the Solid Sound Music Festival. Established in 1927, the Walker is regarded as one of the nation's "big five" museums of modern art along with the Museum of Modern Art (MoMA), the Samuel R Guggenheim Museum, the San Francisco Museum of Modern Art, and the Hirshhorn. Opposite the museum stands the Minneapolis Sculpture Garden, which opened in 1988. The museum's focus on contemporary 20th century art began during the 1940s. Acquisitions have included: The Large Blue Horses (1911) by Franz Marc; sculptures by Pablo Picasso, Henry Moore, and Giacometti; Office at Night (1940) by Edward Hopper; 16 Jackies (1964) by Andy Warhol; Big Self-Portrait (1967-8) by Chuck Close, to name but a few. A number of other artists have enjoyed their first major exposure in Walker exhibitions: they include Joseph Cornell, Frank Gehry, Julie Mehretu, Mario Merz, and Kara Walker. Since the 1990s, the Walker has begun collecting works representing less mainstream art movementss, such as the Japanese Gutai group, Italian Arte Povera, Viennese Actionism, and Fluxus, all of which emerged during the 1950s and 1960s. Founded in 1994, by Bebe and R. Crosby Kemper Jr., whose personal art collection forms the core of the museum's permanent collection, it is Missouri's largest contemporary arts venue. Its collection includes over 700 items of 20th century art by artists including: Robert Motherwell, Helen Frankenthaler, William Wegman, Nancy Graves, Dale Chihuly, David Hockney, Arthur Dove, Andrew Wyeth, Fairfield Porter, Georgia O'Keeffe, Frank Stella, Louise Bourgeois, Christian Boltanski, Robert Mapplethorpe, Nan Goldin, Garry Winogrand, Kojo Griffin, Jim Hodges, Wayne Thiebaud and Stephen Scott Young. Set up in 1939 as the Museum of Non-Objective Painting, "The Guggenheim" now houses a world-renowned collection of Impressionist, Post-Impressionist, early Modern and contemporary art, in its world famous New York building designed by Frank Lloyd Wright. Regarded by many art critics as the most influential museum of modern art in the world, its permanent collection is a Who's Who of 20th century art around the world, including drawings, paintings, sculpture, photography, prints, works of architecture and design, as well as film and electronic media. Its library holds another 300,000 items, including books, periodicals, and individual files on more than 70,000 artists. Specialist collections include MoMA's film collection of more than 25,000 titles and its acclaimed art photography collection, set up first by Edward Steichen and then John Szarkowski. MoMA's Department of Architecture and Design, established as early as 1932 was the first museum department devoted to the subject. Its many postmodernist exhibitions of camera art have included two solo shows (1975, 2008) for the influential husband and wife team Bernd and Hilla Becher (1931-2007; b.1934), founders of the Dusseldorf School, as well as cutting edge portraitists such as Diane Arbus (1923-1971). In 2010, the museum staged a major retrospective for the avant-garde performance artist Marina Abramovic (b.1946), which was the largest exhibition of performance art in the museum's history. Set up in 1971 (as the Institute for Art and Urban Resources), and affiliated with The Museum of Modern Art since January 2000, MoMA PS1 is one of the leaders in avant-garde site-specific art in the United States. As well as organizing its own exhibitions, the institution also runs the International and National Projects series, and the MoMA PS1 Young Architects Program with The Museum of Modern Art. Established in 1977, it is the only New York museum devoted exclusively to international contemporary art. In December 2007, the New Museum opened its new $50 million 7-story 60,000-square-foot building, which in 2008 was named one of the architectural "New Seven Wonders of the World" by Conde Nast Traveler. Predominantly interested in exhibiting works rather than amassing a collection, the museum possesses some 1,000 items of its own in a variety of media. Claes Oldenburg, Robert Ryman, Julian Schnabel, Kiki Smith, Zhang Huan, and Zhang Xiaogang. Founded in 1929, "the Whitney" focuses on American art from the 20th and 21st centuries. Its permanent collection consists of almost 20,000 drawings, paintings, prints, photographs, videos, sculptures, and other contemporary media by some 2,900 artists, including all well known American painters. Keenly interested in exhibiting the latest American art, the museum's Annual and Biennial exhibitions are both well-established venues for younger and less well-known artists, like Keith Haring (1958-90), David Wojnarowicz (1954-92) and many others. See also: Best Contemporary Art Festivals. Established in 1968 as The New Gallery, by Marjorie Talalay, Agnes Gund, and Nina Castelli Sundell it was renamed the Cleveland Center for Contemporary Art in 1984, and given its present name in 2002. In October 2012 the museum opened at its new $27.2 million, designed by London architect Farshid Moussavi. Founded in 1939, the Contemporary Arts Center was among the first institutions in the United States devoted to exhibiting contemporary art. With no collection of its own, the CAC focuses exclusively on exhibiting cutting-edge artworks in painting, sculpture, origami paper folding, architectural design, photography, performance art and electronic media. Established in 1892, the Portland Art Museum is the oldest museum in the Pacific Northwest. Its 42,000-item collection reflects the history of art from ancient times to the 21st century, with 20th/21st century art being displayed in the Jubitz Center for Modern and Contemporary Art, the Gilkey Center for Graphic Arts, and the Northwest Film Center. In 2000, the Jubitz Center acquired the personal art collection of the celebrated New York art critic Clement Greenberg (1909-94); his annotated library is available to researchers at PAMs Crumpacker Family Library. Established in 1994, it is one of the four Carnegie Museums of Pittsburgh and a partnership betwen the Carnegie Institute, the Dia Art Foundation and The Andy Warhol Foundation for the Visual Arts (AWFVA). It is also the largest museum in the United States devoted to a single artist, with 7-storys, 17 galleries, 900 paintings, almost 2,000 works on paper, over 1,000 unique prints, and 80 sculptures. Its collection of lens-based art includes 4,000 photographs, 4,350 Warhol films and videos. It attracts some 100,000 visitors each year. In addition, since 1996, the museum has sponsored over 50 travelling exhibits of Pop Art that have attracted some 9 million visitors in more than 150 venues around the world. Founded in 1927, "The Henry" is the art museum of the University of Washington. Its collection, comprising some 20,000 items, features an extensive photographic content (due to the acquisition of the Joseph and Elaine Monsen collection), as well as a range of textile art.  For more about museums specializing in postmodernist artworks, see: Visual Arts Encyclopedia.